You may not be familiar with Tomm Moore just yet, but we guarantee that in a few short years he will be up there amongst the likes of Hayao Miyazaki, Don Bluth and Brad Bird amongst many others one of animation’s biggest titans. 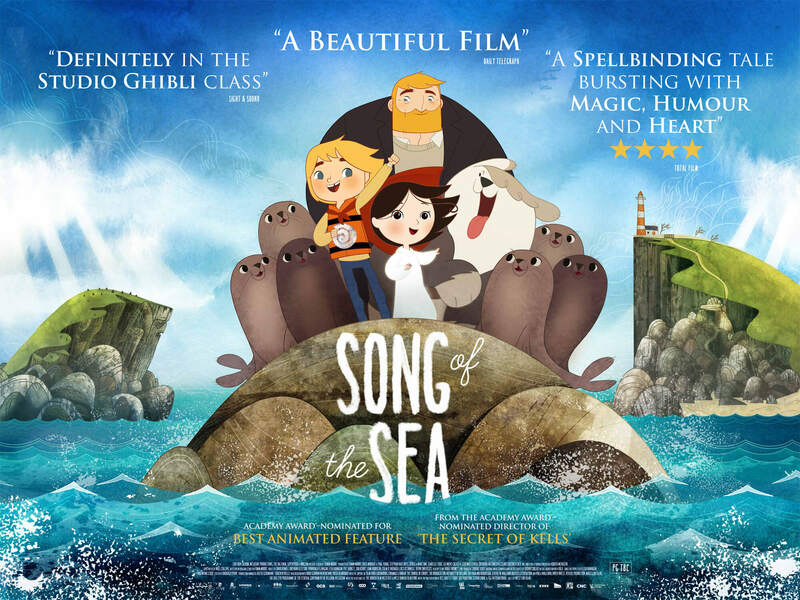 His first feature, 2010’s The Secret of Kells, picked up an unexpected Oscar nomination and is a colourful slice of Irish folklore told through the 2D stylings of Moore and his animation crew – but Song of the Sea goes beyond even that. If The Secret of Kells was his Princess Mononoke, then Song of the Sea is undoubtedly his version of Spirited Away. Moore’s second animated feature as director is bound to not only be an animated classic in the near future, but is almost certain to stand the trials of time alongside the countless films of Disney, Pixar, Studio Ghibli and others. It is a film that literally everyone can enjoy; young children will be drawn into its young protagonists and its simplistic humour, parents will like the mature messages and ideas of accepting grief and loss, other adults will appreciate the storytelling and ties to the Irish mythos, grandparents will adore the old-fashioned style it approaches its story with, and everyone else will be absolutely blown away by its animation, style and payoff. The film takes into accord many Irish folk legends, but most notably the “selkie” myth (as in, women that can turn into seals); that comes in the form of Saoirse, a mute young girl who, along with her older brother Ben (David Rawle), lives on a small island with her heartbroken father Conor (Brendan Gleeson) who is still grieving over the loss of his wife when she was born (an event that ties itself neatly into the film’s fantastical elements, as we later find out). When brother and sister are sent to live with their bitter grandmother (Fionnula Flanagan) on the mainland, so begins an epic journey to reach home and realise Saoirse’s fate, which is where the magic begins. Or, should we say, continues; even before we are introduced to the faeries and the myths of the world that are encountered en route, there is still so much wonder to be found in the world that has been created, normal though it may seem. From the designs of the characters to the background props to the scenery and so on, there is so much magic and inspiration it’s hard to not be remotely engrossed. Moore and his endless team of animators have crafted a world that is inviting and never outstays its welcome, and leaves you pining for so much more than is given to you. From the Irish countryside to the mystical depths of the ocean, there are so many joys in its atmosphere and design that it’s difficult to spot them all in just one go. There is a genuine charm to its characters too, which is more than enough value to sustain multiple viewings. Ben, for instance, is a young kid who displays traditional childish behaviours but never to a point where it’s contrived, and it’s a very believable character for that age. Saoirse, though she rarely utters a word, displays lots of personality and adorable curiosity through just her movements and how the animators construct her facial expressions. Other characters that could have been dangerously bland archetypes, such as the heartbroken single parent or the stoic grandparent, are given such complexity that you start to wonder about their own pasts and how they ended up this way, you just get so invested that you truly care for them. The more comic characters, like a trio of singing faeries, could have so easily been obnoxious products of pandering to the film’s youngest demographic, but much like Olaf in Frozen their humour is very underplayed and just the right balance of providing relief from some of its darker moments and fitting this world’s tone and style. What also makes it unique is its lack of a true villain; the closest we get to one is in the form of Macha, an owl-witch whose gentle and soothing tones actually make her one of the more genuinely frightening antagonists in a family film for quite some time when placed in context, but even then it transpires that her sinister nature is of her own design, and so brilliantly ties into the themes of grief and how we must accept them as part of life. These are perfectly constructed characters, and you’re more than with them for every step of the way. The animation is, by far, some of the greatest you will ever see – we don’t mean in recent memory, we mean OF ALL TIME. We’ve mentioned the character designs and backdrops, but we haven’t even begun to discuss how everything, and we mean EVERYTHING, is brought to life through the means of 2D animation that is drawn and executed so beautifully, making it more fantastical and wondrous than a good majority of the CG animated flicks we get nowadays. In fact, the worst thing about the entire film is that it reminds us just how little this style of animation is used nowadays – many may see 2D animation as something designed for younger children, but films like Beauty and the Beast, The Iron Giant, An American Tail and, yes, Song of the Sea have used it to tell such amazing and timeless stories that will stand the test of time, so it can definitely pass for good entertainment for everyone as long as it’s used accordingly. This is a film that absolutely deserves to rank among those animated classics in the next couple of years, and should at the very least cement Tomm Moore as being one of animation’s most prominent figures. Make sure this has an audience, folks. Song of the Sea is not only one of the most beautifully animated films of all time, it’s not just one of the most creative and likable animated films of all time, but it’s one of the best animated films of all time, PERIOD. It’s an absolute instant-classic.